Print-on-foam - Dino Rentos Studios, INC.
Our Print on Foam Props are great cost effective options for a variety of props and displays! Each prop is custom made to order. 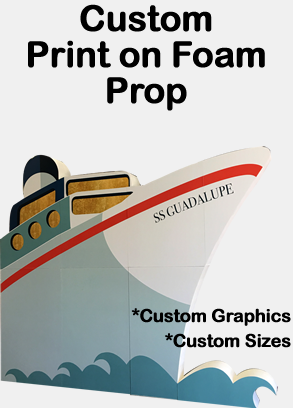 Any of our cardboard cutout standup props can be turned into a Print on Foam Prop. Don't see what you need? Choose your own graphic and size! What is a Print on Foam Prop? Print on Foam Props are FLAT props that are manufactured with a FOAM SILHOUTTE BACKING. Each Prop is applied with a single or double sided VINLY PRINT. These units are NOT 3D. The units do however; provide the ILLUISON of being 3D with its foam silhouette backing, adding depth and shape to the prop.